Everyone knows how cool the Tandy Model 100 family is. But what if you're a hard-core writer. 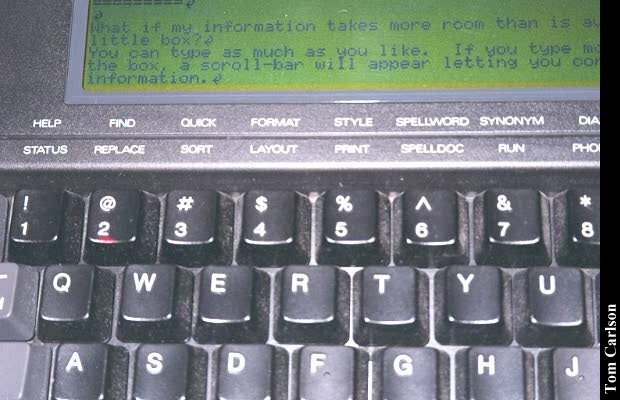 You don't need BASIC or alot of other program, you just need a solid word processor with a great keyboard. Then you probably need a WP-2. It has the same great keyboard as a Model 100. But it has some additional benefits as well. The screen is 80 characters wide. It's not back-lit, but it is so reflective that you might be fooled. It's also quite a bit thinner than a Model 100 (easily less than an inch), and much lighter. It has standard parallel and serial ports on the back. It can also take a memory card for additional storage. And it can use Model 100 perephrials, like the portable disk drives. Software-wise, it has a nice word processor program, with a spell-checker and thesaurus. It also has some calendaring and telecom functions built-in. You can't add programs, but that's okay because it's not a laptop replacement. It's a writing tool. And a damn good one at that! 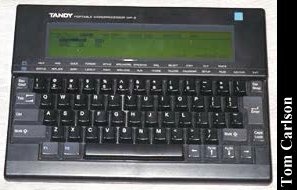 Click here to view all comments for the Tandy Tandy WP-2 and to leave your own.